A “week in review” synopsis of Jim Rickards, New York Times bestselling author of The New Case for Gold, The Death of Money, Currency Wars and The Road to Ruin, on Collide. This is a brief synopsis. For Jim’s full coverage of geopolitical events you can subscribe here. Gold has been a little more volatile than usual, but it’s the normal ups and downs of the market. The long term trends are good. Gold has been in a range between $1,290 – $1,355 U.S. per ounce since late last year. We’re at the low end of that range right now but given the macro fundamentals it was surprising when it was at the upper end. The macro fundamentals for gold are awful right now. The Federal Reserve in the United States is raising rates in two ways. They’re reducing the M0 money supply, which is the equivalent of burning money in an oven to make it disappear. At the same time they’re raising interest rates. That’s two forms of tightening, and it’s the first time in the 100+ year history of the Federal Reserve that it’s being done. The Fed has raised the nominal rates – that’s the number we see on TV. But there’s inflation on top of that number, so we look at the real rates to see the actual impact. Take the nominal rate and subtract the inflation to get the real rate. The real rate is what influences gold. For example, if you had a 3% yield to maturity on a U.S. 10-Year treasury bond while inflation was 5%, then the real rate of return would be – 2%. If that were the case then people would be freaking out and the price of gold would be going to the moon, like the late 1970s and early 1980s. What’s happening right now is the opposite of that example. Nominal interest rates, what we see on TV, are going up but there’s not much inflation. There’s talk about inflation coming, and it will come, but it’s not here yet. The economy’s not that strong. Inflation is mostly a psychological thing and the psychology of the population hasn’t changed. The actual data has been negative – disinflation and not inflation. The U.S. dollar has been strong. So it’s less expensive for Americans to import things from other countries. The impact of the Fed tightening and a stronger dollar is deflation, or at least disinflation, and not inflation. And at the same time the nominal rates are going up and the real rates are going up. That’s all terrible for the price of gold, and yet it was hanging in there at $1,330 per ounce. There might have been some manipulation in that price but the fundamentals see it down where it is now without any manipulation. Markets don’t go up and down smoothly. They jump. That’s normal. Gold is in a bull market that started in December 2017. The Fed is going to keep raising interest rates and reducing the money supply. Jim thinks the economy isn’t strong enough to take it so the Fed will have to pause the interest rate hikes, and that will cause people to go to gold. On top of that there’s the law of supply and demand, with gold being hard to source right now which will bring the price higher. North Korea has cancelled talks with South Korea and threatened to cancel talks with President Trump. Jim believes North Korea won’t give up their nukes and the U.S. won’t let them have them, so they’re still on the path to a confrontation. The pause button has been pushed right now in the hopes that talks work. Iran is hoping that the Europeans rescue them. Trump ended the JCPOA agreement and put sanctions back on Iran. That’s going to hurt them economically, so Iran is hoping they get a lifeline from Europe. Jim believes it will take one or two months, but that Europe will have to choose between doing business with Iran or doing business with the U.S., and they’ll choose the U.S. business. The Iranian economy will be severely stressed and they’ll have to turn to China. That’s bullish for the price of gold because one of the ways Iran and China can do business is to deal with payments using gold instead of going through the wire system. Gold is at $1,291.90 U.S. per ounce. The Vancouver Art Gallery Cafe is a beautiful spot for lunch in the city. This week was the Cambridge House International Mining Conference where I saw the silver guru David Morgan, Daniela Cambone from Kitco News, Chris Parry from Equity Guru, and Jayant Bhandari who I had never heard of but stayed for his whole workshop. He was balanced and brought an ethical angle I admired about doing your own due diligence. I’ll be reading/watching more from him. It was a pleasure to meet and chat with Ed Steer from Gold & Silver Digest and GATA. I asked him if he had advice for a newbie to the metals, or for someone speaking about metals to a family member or friends. He advised buying physical silver over gold at this time because silver is so undervalued. He said that rounds were fine to buy, but that newbies are sometimes timid and like the backing of a government, in which case silver Canadian Maples and silver U.S. Eagles are a good choice. The panel with Daniela Cambone, Brent Cook, Ivan Bebek and E.B. Tucker was informative on what’s true or “fake news” about gold mining stocks. I’ll link to the panel discussion when Cambridge House posts it. The jewellery packaging is coming along beautifully. So happy with the recycled paper and linen look. Here’s a private message I received from David Crosby on Twitter. The song was “A Terrible Breeze” about nuclear war, and the news coming down on Twitter. That was kind of David. I don’t think my worldview and political views are the same, but I’m honoured he said something so kind. More music to come. More art and words to come. The world is beautiful. Thanks for being in it. The Single is featured in Episode 1 of Mike Maloney’s documentary series Hidden Secrets of Money. 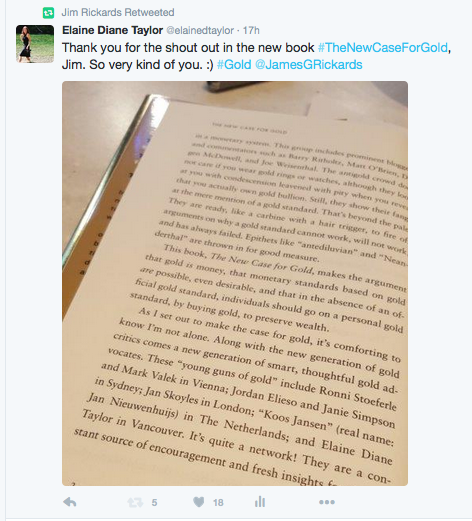 Jim Rickards was very kind of mention me in his New York Times bestselling book The New Case for Gold.